This is one of my favorite pictures of my dad. He is milking a fake cow at a museum and he looks like it is the funnest thing he has ever done. Like my brother, he doesn’t smile in pictures, so when you get either one of them generally happy, you get something like this. The smile never happens in a family picture – just of them doing something slightly absurd. My dad spend a good chunk of his weekend talking about all of the history of the US with me. He went more in depth than the text I was looking over and had some interesting historical insight. Then he reminded me I need to buy a car. I’m lucky to have him. Happy day after your day Dad! 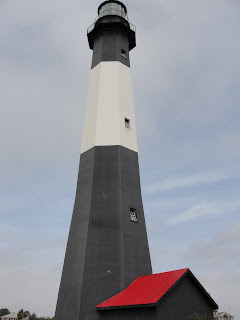 We got to Tybee Island lighthouse at the same time and a church group. An elderly church group. So we walked up the stairs, shared landings, and walked down the stairs behind ladies discussing what it was physically like for them to climb 200 steps. It was also insanely windy. I am currently trying to make some changes in my life and everything is turning out to be harder and more complicated than I anticipated. It is already June 9th and I have the majority of my summer planned by what must be completed each week and weekend to make my goals for Fall. In the past two years, I have experienced and learned a lot, but I got comfortable. And although I am prone to anxiety, my intense anxiety has been on a hiatus. I have had a similar routine since graduating, I first worked days for a year and a half and now I work 11-7. I have worked out regularly and then stopped and back and forth and back and forth. I’ve had countless dinners and happy hours. I have driven to San Antonio for weekends with my momma and to Katy for meals and board games with the Oswalts. Now I am attempting to shake things up. To do list items that were labeled as “easy” when given a spot on the calendar are turning out to be timely and difficult. Let this serve as a notification to all those who endure my craziness. The FEAR is here. Magnolias in Savannah calm THE FEAR, I think I should have just stayed there for the summer. On my journey a few weeks ago, Mike and I stopped in Savannah, Georgia. It was gorgeous, old, and chilly. We were not prepared with warm clothes. I had a fleece that I’d brought for my flight to Orlando that I wound up wearing everyday. Mike had sent his winter clothes home with mom, but found a Christmas sweater in a suitcase that he wore everywhere. Since I brought the camera, all of my vacation pictures consist of Michael standing in front of something. There is a lot more where this came from, but one only needs so many pictures of her brother. Above is the hearse that we traveled around town in. 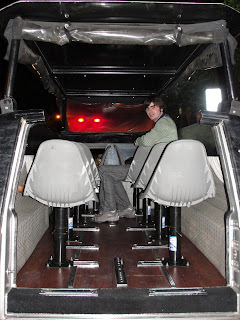 Ghost tours are only worth the time if done from the back of a hearse. The tour guide dropped us off last and then discussed with me how he thought Savannah must be over a pocket of energy, like in LOST, spirits are drawn to this spot. He stated very plainly that he had seem more ghosts in Savannah than anywhere else. The tour guide said they had similar tours in New Orleans, where he is from, but there were no real ghosts there. Soo…. if you are looking for ghosts, Savannah is your only option in the deep south. 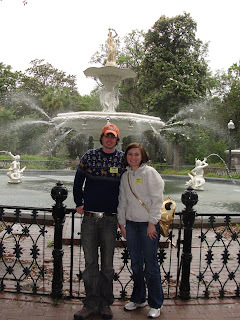 We tried to watch Midnight in the Garden of Good and Evil because it is mentioned every two minutes in Savannah, we were bored instantly. Above is the Mercer house, the setting of the book and film. Above, Michael and I drinking wine in a 200+ year old basement, we know how to have fun.